In the field of climate mitigation, a more and more important crucial component of an effective decision making is the selection and the prioritization of which actions to implement among a range of possible alternatives. In this regards, the Cost-Effectiveness Analysis has become a quite common approach in supporting the prioritization process in a performative way. A specific type of cost-effectiveness analysis, emerged during the last years, is the Marginal Abatement Cost Curve (MACC). Despite its first application in the energy sector, this analytical tool is finding a growing interest also at the urban level, allowing to compare not only the economic costs of a measure but also its abatement potential in term of CO2 reduction. This research tries to investigate the application of the MACC approach at the city level in Italy, a country in which the previous examples of similar application are much fewer than in other countries. 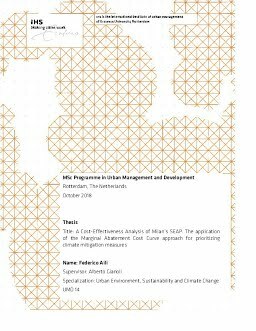 The municipality selected for this study is the city of Milan, due to its international dimension and a strong committment in the battle for climate changes emerged in the last years. In addition, during 2018 Milan’s municipality has been also involved in the approval and adoption of the new Sustainable Energy Action Plan (SEAP), that includes a variety of measures with different targets and different emission reductions expected. According to the availability of data, this research aims at developing a Marginal Abatement Cost Curves of some of the measures included in the SEAP, in order to assess their costeffectiveness and contribute to the evaluation of which actions should be prioritized and implemented. A first part is dedicated to a detailed literature review in order to figure out the space for developing the MACC tool and the most critical point from a methodological point of view. Second, the process of data collection is presented, with also its limitations. Thirdly, different MACC are built in order to investigate the effectiveness of the measures part of the scope of the research. In short, the most effective measures in terms of financial savings is the plan for the efficiency of the public light system, while for what concerns the abatement potential of CO2 emissions the measures more performative are the municipal notices for increasing the energetic efficiency in private buildings. The limited availability of data and some intrinsic rigidities in the model call also for a broader evaluation, able to review and update in a flexible way the data collected. Furthermore, in the conclusion there is also the space for reflecting on future improvements of this research. Crucial points are the consideration of all the stakeholders involved in the measures proposed by the SEAP and the treatment of other issues conventionally excluded from the MACC approach, like co-benefits and other externalities.